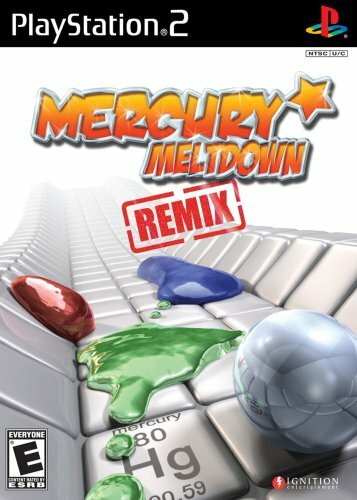 Mercury Meltdown Remix lets you take control of the little Mercury blob from the original Mercury Meltdown. Players must avoid various obstacles and hazards to reach the end goal. The Mercury blob itself has now been given an overhaul and has 4 varying states Normal, Solid, Fast and Slow. These states allow for larger more complex levels, which in turn mean a greater challenge and more enjoyment to be had for the player. Fairer Game progression Super Fast load times Tutorial Mode Downloadable content Game Share 5 New Mini-Games - Stretch your brain with Metrix Aim for the target with Shove Beat your rivals in Space Use tactics and strategy in Paint Test your balance in Rodeo Mercury Meltdown Remix for the PS2 brings an amazing amount of control to the camera and blob by use of both analog sticks on the dualshock controller. The control is unbelievably intuitive allowing for full concentration on the mind-tingling levels themselves.